Associate Director JCYC Educational Talent Search (JCYC ETS) SF College Access Center (SFCAC) Gina is an alumni of JCYC’s College Access programs as well as a recipient of the organization’s scholarship program. 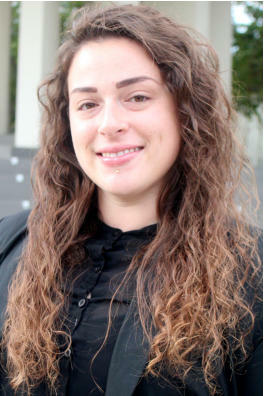 During her last year of college Gina was hired as an Educational Advisor for JCYC’s San Francisco College Access Center. Through her role as an Educational Advisor, she provided guidance to students on the college admissions process, academic course selection, college search, financial aid assistance and much more. In 2012, she transitioned into a similar position as an Educational Advisor for JCYC’s Educational Talent Search program. As a result of her outstanding performance, in 2015, Gina was promoted to the role of Associate Director where she now manages the same services she benefitted from as a youth. Gina Gutierrez Associate Director JCYC Educational Talent Search (JCYC ETS) SF College Access Center (SFCAC) Gina Gutierrez is an alumni of JCYC’s College Access programs as well as a recipient of the organization’s scholarship program. During her last year of college Gina was hired as an Educational Advisor for JCYC’s San Francisco College Access Center. Through her role as an Educational Advisor, she provided guidance to students on the college admissions process, academic course selection, college search, financial aid assistance, and much more. In 2012, she transitioned into a similar position as an Educational Advisor for JCYC’s Talent Search program. As a result of her outstanding performance, in 2015, Gina was promoted to the role of Associate Director where she now manages the same services she benefitted from as a youth.